Some of you may feel like you've been in the dark throughout this financial mess. Many investors and members of the media are of the impression that only large institutions have an edge. One would think that some of the largest banks in the world might have better information than the average Joe. Earlier this year we highlighted an analyst downgrade of ABK. That analyst rated the stock a buy throughout a 90% decline and has since dropped coverage. This morning several other analysts changed their ratings on FRE and FNM. These analysts will go nameless, but one chart in particular is displayed below with the historical recommendations. 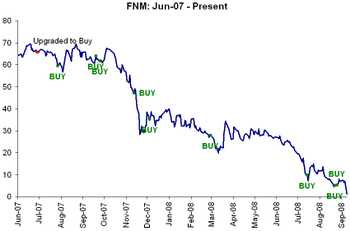 As shown, if we had followed this analyst's recommendations we would have begun a position in FNM at $65, added to it nine times and sold it at $1.91 (being generous) on the open this morning. One of two things is occurring, either 1) the analysts don't know how to use their tools or 2) their tools are broken. We are more inclined to believe the second hypothesis. Please click here to read more about some of the investment tools provided by Birinyi Associates; identifying trading parameters for stocks and seconds, trends (don't fight the tape), and specific price points.